Wow the Beginning of the "Fall Show" Series. Well, the notifications are coming in and I feel very excited about this 2009 Fall - Winter show schedule. As all the information comes in, I began to think to myself "Wow, now I have to create work to sell at all of these events. I must say it's a little crazy but it's a challenge I'm will to take. 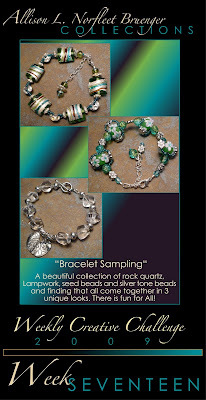 This week I'm previewing some of the bracelets that will be for sale at the Big A$$ Indie Art and Craft Show at Mad Art Gallery in St. Louis,MO. The opening night is next Friday and I will be working that night to greet the guests and show them all the beautiful jewelry showcased at the event. In September I have 3 shows so far to get ready for (maybe 4). Wish me luck. I will show all of you my progress in the weeks to come. Take Care and Keep Being Creative!